The following obituary was taken from the Beckley Post-Herald, dated Friday Morning, October 24, 1941. 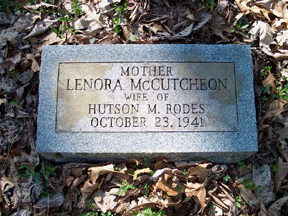 Hinton - Oct. 23 - Mrs. Lenora McCutcheon Rodes, of Meadow Creek, mother of T. G. Rodes, of Hinton, died at 8:40 o'clock Thursday morning at the Hinton hospital. She became ill about six weeks ago, and was admitted to the hospital last week, suffering from pneumonia. The daughter of Bernard McCutcheon and Martha Crane McCutcheon, of Summersville, she had resided at Meadow Creek for 38 years. Her husband, H. M. Rodes, a prominent Raleigh county lumber man, died several years ago. The body was removed to the Ronald Meadows Funeral Parlors on Temple Street, and will remain there until time for the funeral services, which will be conducted at 2:00 o'clock Saturday afternoon at the Meadow Creek Baptist Church. She is survived by three sons; T. G. Rodes, of Hinton; D. G. Rodes, of Meadow Creek, and Nye G. Rodes, of Logan; four daughters; Mrs. J. G. Taylor, of Wheeling; Mrs. E. T. Donnally, of Charleston; Mrs. G. M. Sandefer, of Washington, D.C., and Miss Ellen Axson Rodes, of Charleston; two brothers; Dr. L. N. McCutcheon, of Richwood, and Dr. Luster McCutcheon, of Marlinton; one sister, Mrs, Laura Graham, of Summersville; 13 grand children and four great grandchildren.